The Book of the Treasure of Alexander, attributed to Alexander the Great and his tutor, the philosopher Aristotle, is a medieval Hermetic text of alchemy, astrology and astrological magic. This is the first complete English translation of this key text, originally written in Arabic, which explains a wide variety of practical applications of occult virtue and the hidden powers of Nature. The Book of the Treasure of Alexander contains a fascinating look at Arabic alchemy with instructions for preparing the Great Elixir or Philosopher's Stone. It contains a dozen poisons, including the "Royal Water", the "cold poison" and the "poison that kills through laughter" as well as the antidotes to these poisons many of which have their powers enhanced through their creation according to astrological timing. The Book of the Treasure of Alexander contains 30 new astrological talismans, most provided with special images from the original Arabic manuscript and a new set of planetary invocations for Venus, Mars and Mercury accompanying its section on creating astrological statuettes. Translated from the Portuguese critical edition by Nicholaj de Mattos Frisvold and edited by Christopher Warnock, the Book of the Treasure of Alexander is an invaluable addition to the library of scholars and practitioners of authentic Hermetic astrology, alchemy and magic. It is available in paperback standard edition and in hardcover standard edition. Here is an extract from the Standard Edition. The Book of the Treasure of Alexander is also available in a special hardcover Poison Edition. Here is an Extract from the Poison Edition. 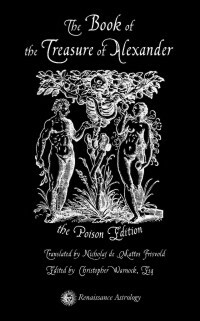 The Poison Edition contains the astrological poisons of Ibn Wahshiyya, Ibn Wahshiyya was a celebrated 9th century Nabatean alchemist, scholar and mage, who wrote a number of esoteric texts including books on magic, alchemy, ancient alphabets and most famously, Nabatean Agriculture, an important source for Picatrix. The standard editions are illustrated with alchemical vessels and symbols and the Poison Edition with danse macabre motifs. All editions contain a variant source appendix with special planetary exaltation talismans. The Book of the Treasure of Alexander is also available in deluxe hand clothbound imperial octavo Standard and Poison editions with gold stamped leather spine label and hand made slipcover. Each of the deluxe cloth bound editions is made individually, specifically for the owner and can be dedicated to them by name on the dedication page. Planetary consecration is available on request. For ordering the book, click HERE.